Boasting 274 days of sunshine a year, Hamilton Island showcases some of the most glorious tropical scenery in the world. From the Great Barrier Reef and spectacular marine life to the coral fringed coastline & iconic Whitehaven Beach, Hamilton Island is Australia's tropical heaven. Here are 5 Things You Probably Didn't Know About Hamilton Island. 1. It Has Amazing Hiking Trails. From striking crystal-clear waters to technicolour tropical reefs, Hamilton Island is known for its incredible beaches and pristine coastline. But what many are unaware of, is the incredible National Parks and bushwalking trails on offer. Visitors can venture on a number of different hiking trails which vary in degrees of difficulty. Be sure to pack your sneakers and plenty of water and get ready to explore secluded sandy coves, zigzag through lush tropical vegetation and discover spectacular peaks with breathtaking views! 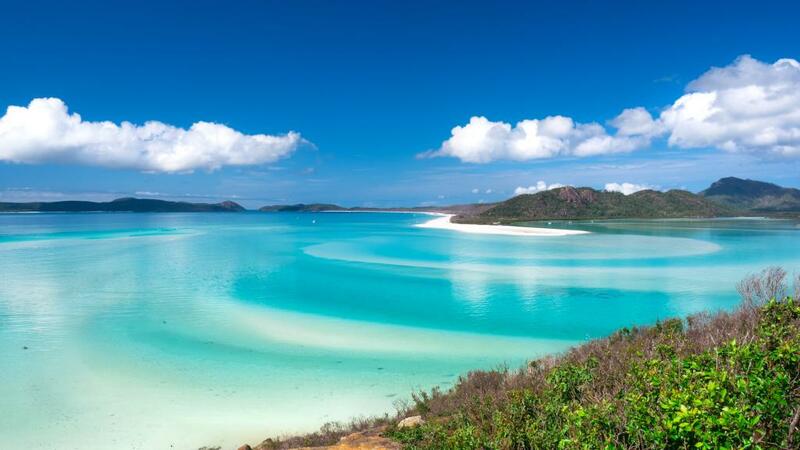 The dreamy pristine white sand of Whitehaven Beach has been named the second-best beach in the entire world. Stretching just over 7kms, Whitehaven Beach boasts dazzling white silica sand that is fringed by turquoise blue waters, and lush green vegetation. Located just a half an hour off the coast, no visit to Hamilton Island is complete without a visit to the world-famous Whitehaven beach. Boasting beautiful tropical landscapes, stunning year-round climate and an abundance of things to see and do, Hamilton Island is an excellent family friendly holiday that offers a huge selection of entertainment for kids. From Snorkelling and swimming to mini golf and kid's clubs Hamilton Island is a world-renowned destination for families. With many hotels & resorts offering free water sports and activities, Hamilton Island is perfect for your next family adventure. On Hamilton Island, you won't find cars, busses or even trains - instead the primary mode of transport is golf buggies! Hiring a gold buggy is a great and convenient way to get around the island at your own pace, all you need is a valid driver's license. Booking your buggy in advance is highly recommended as they can sell out in peak season. Boasting panoramic views of the Whitsundays, Coral Sea and Great Barrier Reef, Hamilton Island is a golfing paradise like no other. The Hamilton Island Golf Club championship course is the only golf course on its own island in Australia. Test your skills on the spectacular par 71, 18-hole championship golf course, take in the phenomenal views and then retire to the clubhouse to relax with a beer or two.